Let’s be honest- castles are there to be assaulted. I can’t tell you the number of times I’ve seen a castle in the distance and thought to myself: “Now those are some walls that I’d like to scale!” Just the thought of assaulting a castle amongst a horde of ravenous comrades gives me the chills, as I’m sure it does for you, dear reader. 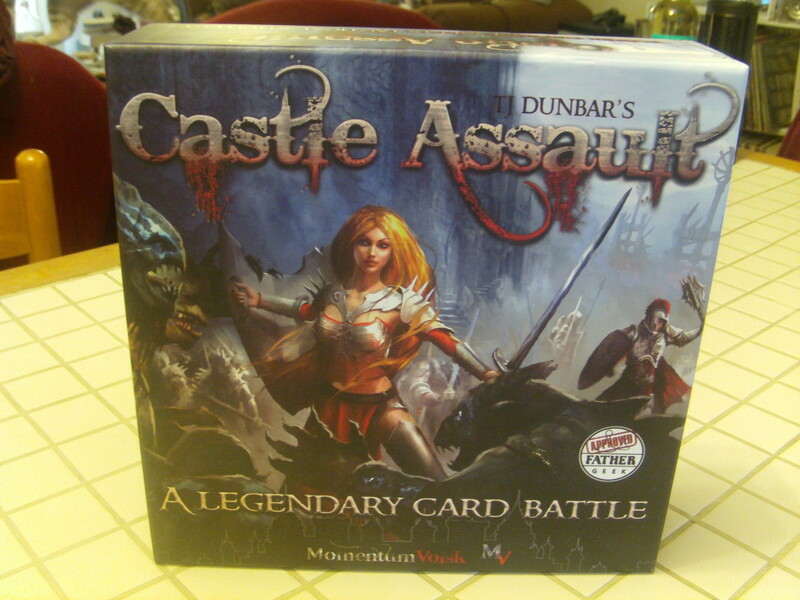 Well, today you are in for a treat, because we are taking a look at Castle Assault from Momentum Volsk and designed by TJ Dundar (who we interviewed not that long ago.) Is it as fun and rewarding as I imagine assaulting a castle would be? Read on to find out! 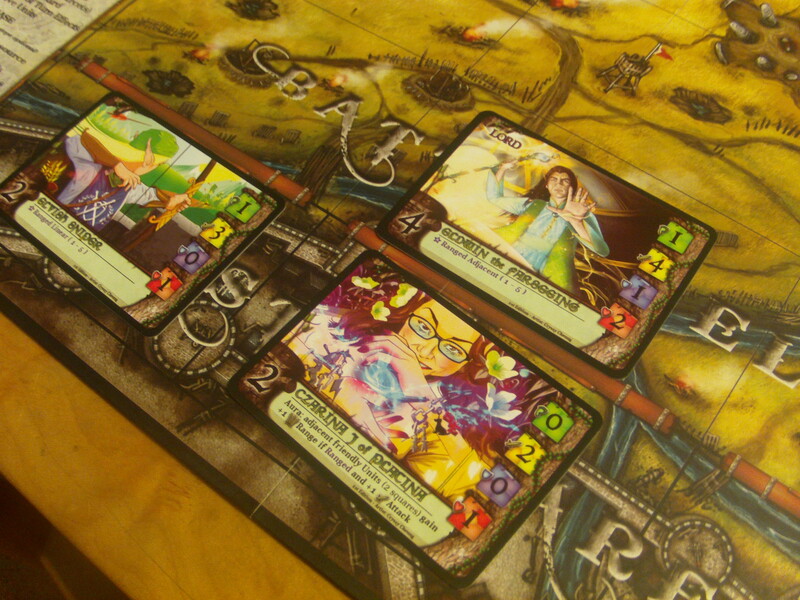 Castle Assault is a grid based, tower defense-styled card game for 1-2 players, with games lasting roughly 20 minutes to an hour. 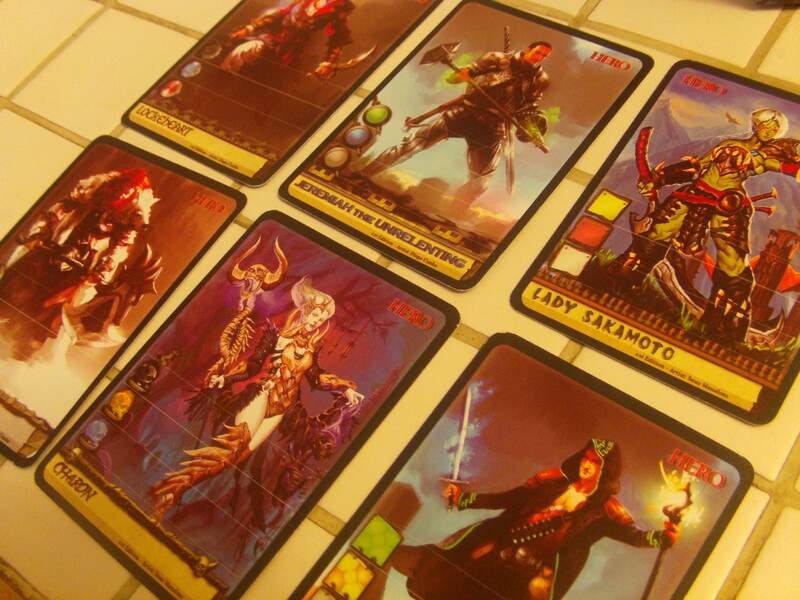 Each player uses a deck of 34 cards of a specific faction (either the Undead, Vampires, Werewolves, Elves, Humans, or Orcs) to which they may add up to six neutral cards (cards that any faction can use) before a match begins. Cards are either Units (soldiers that are played to the board) or Commands (cards that can either be attached to Units or played to grant one time only special effects.) 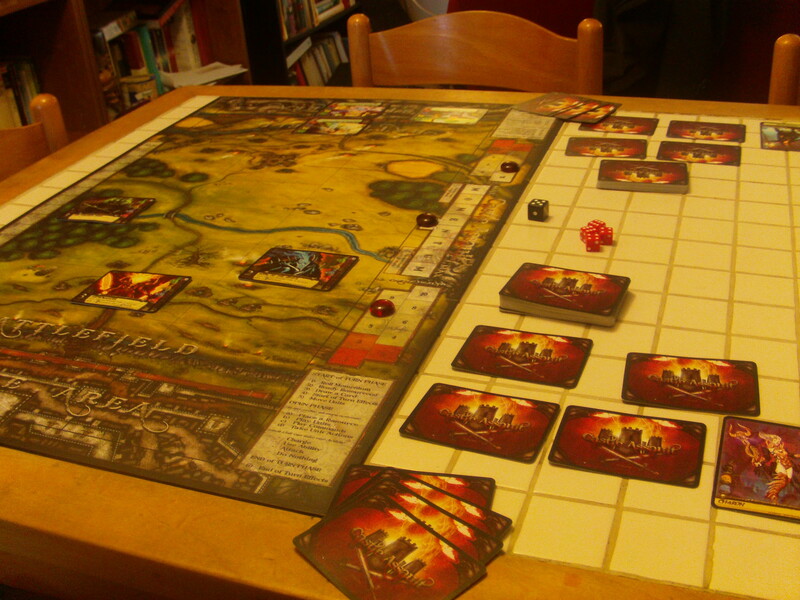 The turn after they are played, Units will start their inexorable march down the board towards your opponent, engaging in battle with any Unit that stands between them and your opponent’s castle wall. When they reach the castle wall, a Unit will deal damage directly to the castle itself. Reduce the health of your opponent’s castle to zero and you win! A word to the wise, however- do not get attached to your units. The turn after they are played, they will begin to move down the board towards your opponent, who will place units of their own in their way. When two units meet, combat is immediate and damage is dealt by each unit to each unit- often resulting in them annihilating each other. 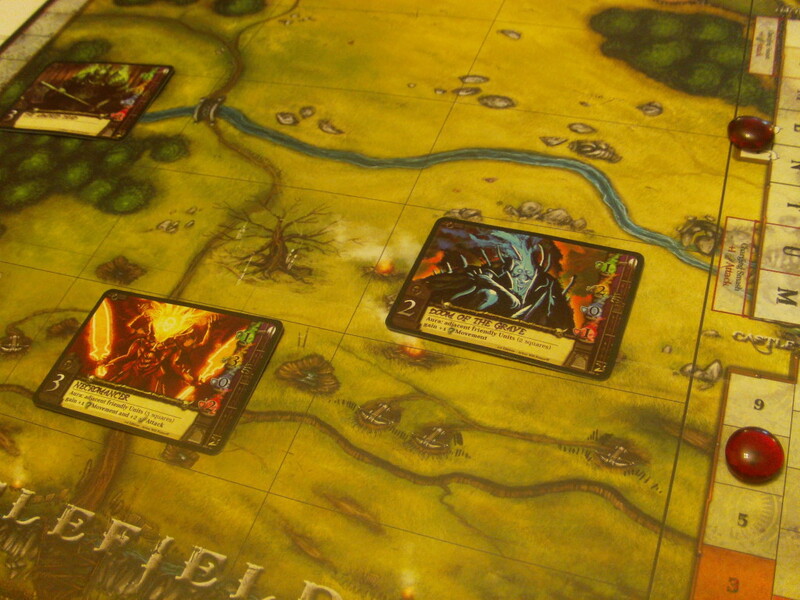 You will send unit after unit down the board to their inevitable doom- nothing can be done to help them. The pawns of your faction will break themselves upon the immovable object that is your opponent’s sheer will to survive. Now keep in mind, dear readers, that I am simplifying this game somewhat. I haven’t touched upon the charge aspect (an action your units can take to charge up the field of battle, possibly injuring anything they are stopped by) or Hero cards (each faction has a Hero that can be played for free at any part of the game- this is a super powerful unit that can turn the tide of battle, but if they die, you instantly lose the game.) Suffice to say, there are several layers of strategy in this dense box of cards, dice, and glass tokens. But the real meat of this game are the different factions. Each faction has their own strengths and weaknesses and play in their own unique way. The Undead’s units can resurrect, returning to the board to fight a second time, the Elves are ranged fighters who can pick off their enemies from halfway down the board, Werewolves have haste and can summon other allies to help, and so on. To really get to grips with this game, you’ll need to have experience with each faction and how they play. The best way to learn this game comes in the form of the single player campaign. Over the course of several missions, you will pit a chosen deck against a special deck of cards. What’s more, not only will this get you familiar with a given faction, but if you complete certain objectives on a mission, you will be able to enhance that deck’s hero by attaching a sticker to the card, thereby giving it a new ability. Fully level up your hero and you will have a formidable unit on your hands, capable of single handedly laying waste to an enemy army and clearing the way to the enemy castle’s walls. I have to say that some real thought and care went into this single player campaign. Unlike many games, Castle Assault wants you to spend time with it alone- it wants you to become familiar with what each of these factions is capable of and it rewards you for doing so. There are six different factions, each with their own upgrade-able hero. Which faction will you choose? 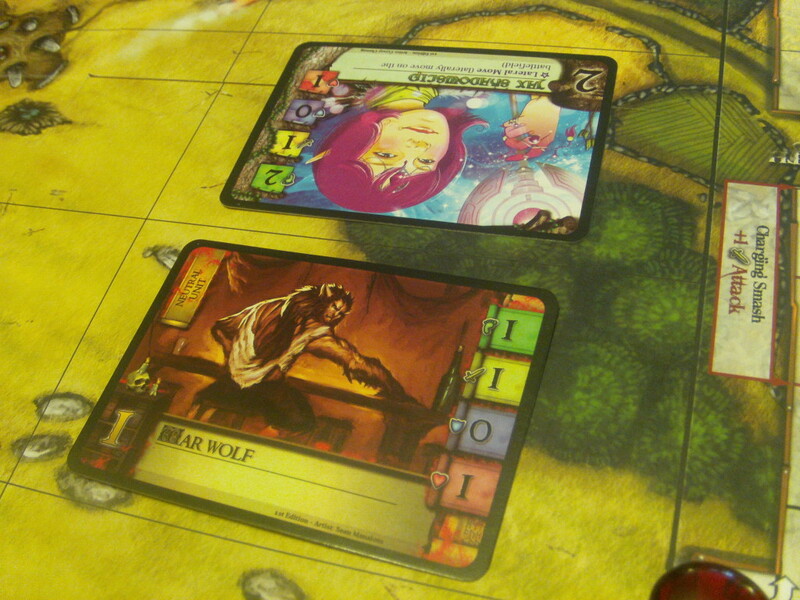 So in the end, Castle Assault can be a bit of a tricky mixed-bag of a game. On the one hand, there is incredible variation inherent in its structure in the form of the many different factions you can play with. On the other hand, there isn’t much variation in what cards compose that deck. On a third hand, the amount of factions to choose from can make picking a faction to devote your time to a daunting proposition. On yet another hand, the well-crafted single player campaign can help you to learn which faction is best suited to your playing style. There are flaws in this box, but the game itself seems to be trying to help you navigate those flaws- something that is a sign of how much thought and effort went into crafting this unique gem of a game. I will say this, though- I really enjoy it and I am eagerly awaiting to see what comes down the road concerning this game. Maybe there will be expansions that instead of adding more factions, add more cards for the existing factions- allowing you to swap cards out of decks for a more personalized experience. I think that that is something that I would really like to see. Until then, however, Castle Assault remains an incredibly well-designed game that is a solid play for one or two players. If you’re looking for a good two-player game to play with a spouse or friend, this may just be the game for you. And so, with that, A Space Ahead heartily recommends Castle Assault.